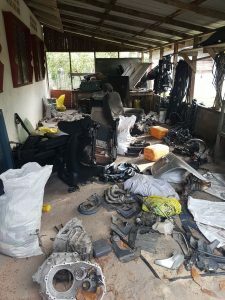 Two welders were Monday arraigned for the alleged illegal use of chassis numbers on two vehicles that were suspected to have been stolen and found at Kuru Kururu earlier this month as part of a Guyana Police Force operation to smash a carjacking ring. Charged with fraudulent imitation of identification mark in violation of the Motor Vehicle and Road Traffic Act are 23-year old Ricky Chung and 42-year old Nigel Chung, both welders, who reside at Lot 5 Coverden, East Bank Demerara. When the charges were read to the Chungs by Principal Magistrate Judy Latchman, they pleaded ‘not guilty’ to both charges and were granted GY$200,000 each for each charge on the condition that they report to the Brickdam Police Station every Friday. They were ordered to return to court on March 12, 2018. They were arrested on February 17 and charged on February 26, 2018 with fraudulently using chassis plate # 121-3151388 on a Toyota Spacio which was originally owned by 59-year old Samuel Munroe, a chauffeur of Lot 2369 Non Pariel, East Coast Demerara whose original vehicle is PMM 7517. That offence was allegedly committed between December 17, 2017 and February 10, 2018. Police said that between December 9, 2017 and February 10, 2018, they also fraudulently used chassis plate # NZT240-0011309 on one Toyota Allion which was originally owned by 34-year old Trechel Powers, a cook of Lot 198 Eve’s View, Annandale, East Coast Demerara, whose original vehicle bore licence number PVV 6791.